I have thoroughly tested this game, and really enjoyed laughing at the people playing it in front of the camera. And the blue magical pinging wands have taken a great deal of flailing and prodding. I have tried it with a two year old, a twenty two year old, and a class full of sixteen year olds. We’ve enjoyed busting the bubbles, eating the bubbles, letting the bubbles land on the baby, letting the baby eat the wand, letting the babies and teenagers fight over the wands. Stock up on a premium bubble mix to get the optimum bubbles, our video is using the Bubble Buster provided bubble mix, and that gives you about 25 minutes of bubbles per pot. But the four batteries you need to put in the machine will last longer than that, as will the bubble busting competition so you need to premix some washing up liquid . We had a go with an eco-washing up liquid mix and it did not produce half as many bubbles with the magic *ping* that makes the wands go off. What is this Moon Dough? 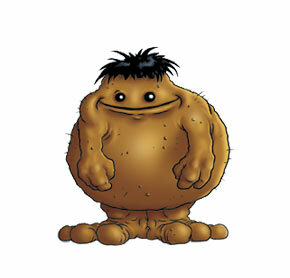 and that I am a munty flumple and Lil Smasha is a gum spudlet or was it a glonk .. So we tried out the Moon Dough ice cream factory in some small fits of giggling hysteria at the fact I was actually a munty flumple mummy. However although for a few moments Destruction Testa cranked the little handle with all his might and yes, it he did make it come off a few times. However he was quickly bored of the ice creams themselves, as they did not taste too good. 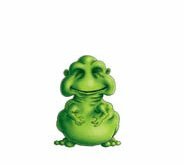 He did eat, well he licked, the moon dough a few times. Then he decided that a mernimbler would actually want to stick a spud gun into the Moon Dough and shoot it at a gumspudlet more than make prettily decorated ice creams. It shoots quite far out of a spud gun as it is a light moulding dough, I’d estimate the range is about one metre. Daddy would know better as Mernibler shot him in the dinner. That’s not a typo, he actually aimed it into his father’s dinner. Then he realised that sticking moon dough into the grooves of his shoes was a worthwhile enterprise. At this point I intervened. I touched the dough and had a play with the ice cream machine as well, the dough is surprisingly light, and we mixed the green and white together and it marbled in a pretty way. It does not smell or taste very nice, which is probably a good thing if you are printing out raspberries and gummie-bear shapes in icing shades of green, white and pink. The ones on the box looked delicious, and I’m surprised how accurate a two year olds version of the imprints were. It is an ‘easy’ substance to manipulate, but a difficult one to make accurate mouldings with, since as soon as you touch them you affect them. DT is quite heavy handed so this is not a moulding product for him quite yet, although he might use it to learn tiny delicate hand movements in the future. It is nothing like PlayDoh, it doesn’t dry out, and go mouldy. 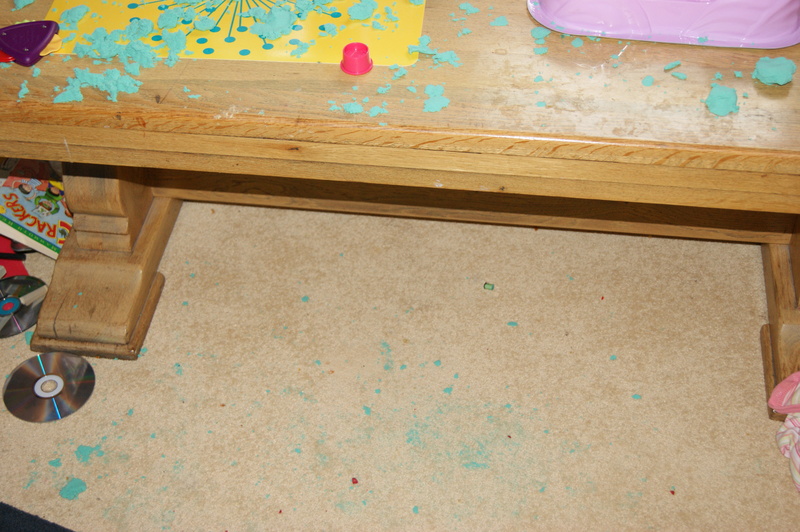 Here is our PlayDoh that I have just binned because of the circular white moulds growing on it. We put the Moon Dough through the Playdough factory printer and we used all our dough cutters and tools on it, and it is a soft and malleable dough which does everything you’d want it to if you are two and do not care much for accuracy. Because the dough is so light, and so crumbly it gets into small flakes very easily, and there is a great deal of dough attrition, and the bags you get are quite little to start with. Especially if you are shooting gumspudlets all over the living room with it. 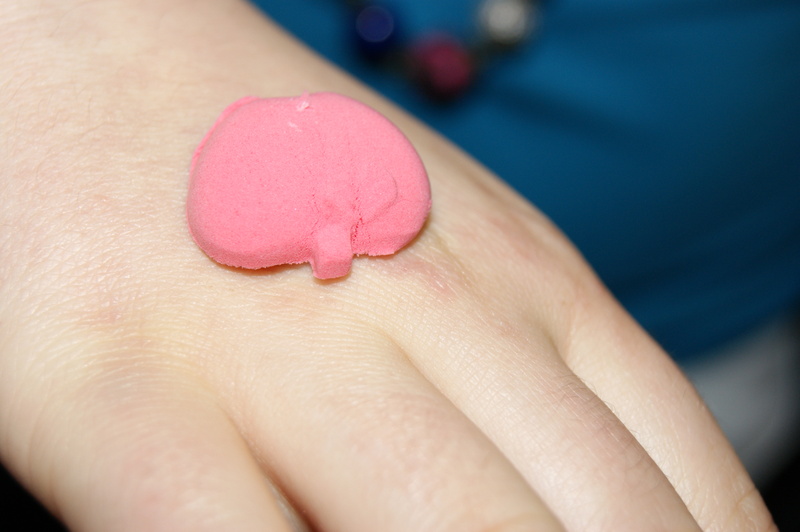 It does not do that thing that play dough does, when you get a lump of it and dab it onto the small escapee doughlettes and it collects it all up, even though on the websites helpful hints it does say to do that to get all the bits. The MoonDough website also says that you’ll have to use a standard comb to loosen the bits from the carpet before hoovering. When hoovering it … well I think Mum’sThe Word has said it all on her blog and her Dyson photos tell a thousand words. I don’t think Mum’s want to be down on the carpet combing the pile before they can hoover it up. I also tested this product with some A-Level students, they thought is was weird and also thought that you would have to be a very delicate child to manipulate your ice cream decorations onto the ice cream without breaking them as they are light and crumbly. Here they are having a joyful time on a philosophy open day and discussing whether there is a Platonic Form of the Perfect Moon Dough Strawberry. What is this MOON SAND ? 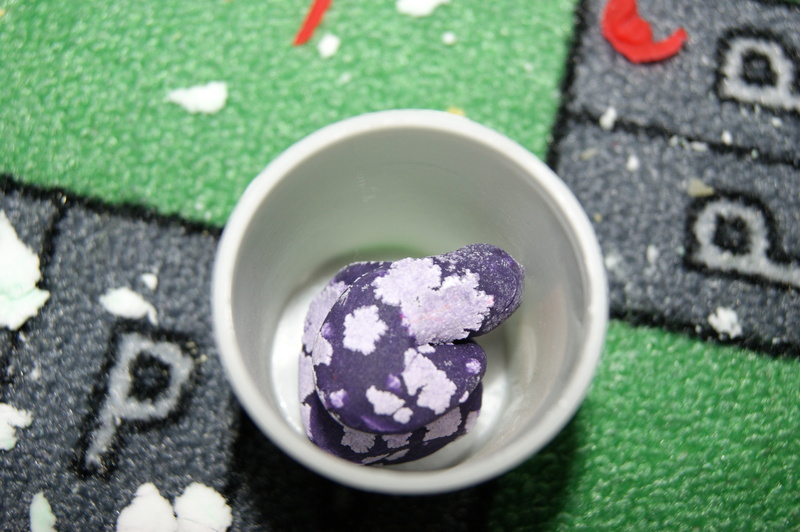 Our first Moon Sand ever! Moon Sand, never heard of the stuff, but Destruction Testa knew about it from his nursery and opened the box himself (slight damage ensued). You need to use the Candy Shop Box as part of the imaginative place to play sweet shops in so open it carefully or the ‘edges’ which are pink moulded plastic actually come off. I stuck them back on with selotape for this picture : ) The front of the shop, the display front bends over (carefully) and clips on to make a little store front. 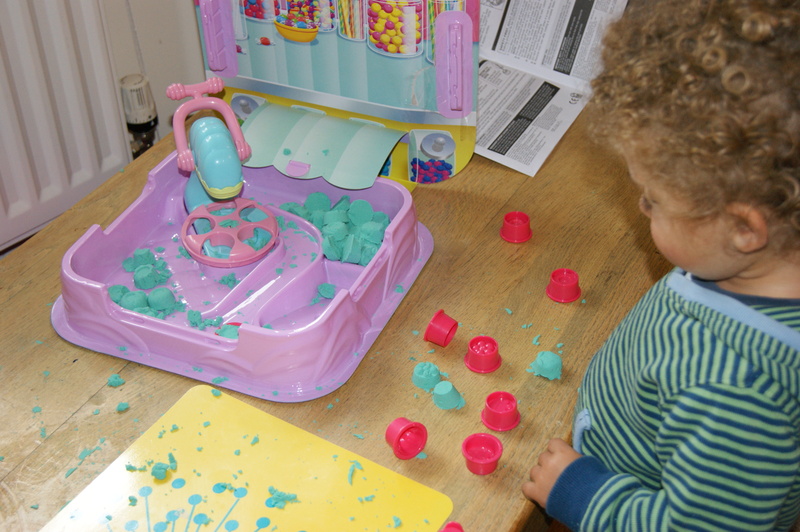 Here is my tiny entrepreneur beginning to set up his factory and press out little moulded sweeties. You do get two colours of sand in your pack, but as a mean mummy I only opened one up for this play session. After I touched the Moon Sand I decided that it is very strange, and I wondered about what chemicals could be in it to make coloured sand, after a little squadging and squidging turn into a doughy-plasticiny-mouldable substance. The only substance on the planet that I can think of that does that is …. no, I can’t think of anything that does that. Clever though, and I thought I must look it up, once I had looked it up it seems that loads of ingenius american mummys are making it with playsand and cornstarch. So i’ll put one of the recipes I found on the bottom of this review and maybe compare the two… if I’ve got time. Moon Sand and Your Carpet. Moon Debris on the carpet – it does hoover up nicely. We have an ideal carpet for testing this product as ours is cream. The stupidest colour carpet known to any mothers anywhere on the planet. Our Moon Sand is green. The Company website lets you know that -”Playing with Moon Sand on a carpeted area is ideal as it makes for an easier clean up by use of a vacuum as opposed to sweeping. Sand that is on hard wood flooring can make the surface slippery.” [Does this not give you a huge clue that if your kids are the slightest bit messy that this should not be an indoor activity? - They actually want you to play with it over carpet so that when sand does drop 1.You won’t realise how much sand is getting away from just brushing off your hands between molding things and is moving around the room attached to your child and also 2. Hopefully you’ve purchased a colour of Moon Sand that is complimentary to your carpet, because it’s probably got a high chance of working itself down into the fibers. Destruction Testa did stomp quite a bit of it around the sweet shop area, but I can't notice any of it now. Here is Destruction Testa making ice cream flavour sweeties, and selling them for a cool fiver to Auntie Betty! Mix the water and cornstarch together thoroughly, this will take a few minutes to get it nice and smooth. Gradually mix in the sand, one cup at a time. You’ll need to really work it in with your fingers. When you’re all done, pop it in an airtight container. When you next play with it, you’ll need to revive it with 2-3 tablespoons of water. Just sprinkle it over and work it in. 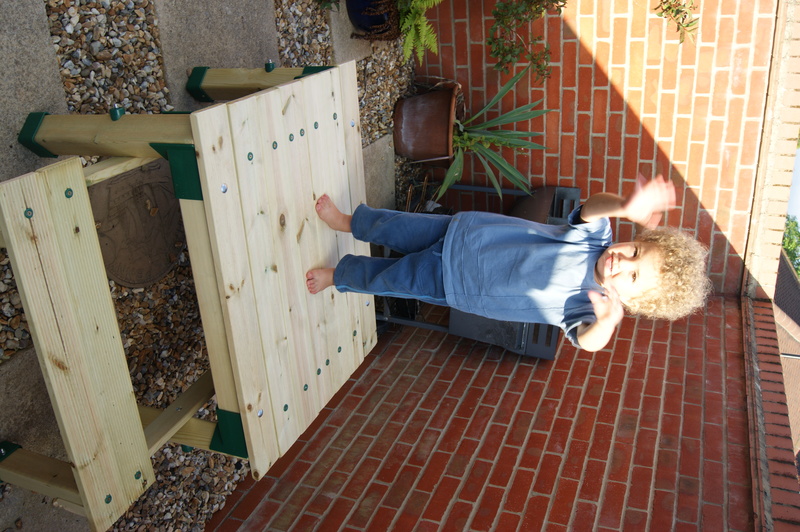 Review of the TP Forest Deluxe Picnic Table Wooden Sandpit featuring Craig from Big Brother! This saturday I did a building project, but I bet you are more intrigued about how Craig from Big Brother ended up involved in my toyology… well you’ll have to read on as that bit comes later. I built a sandpit table almost single handedly. It is awesome now it is finished but took a lot of swearing and growling to get it to the perfect state that it is now in. I had some helpers, Auntie Betty from Sheffield made a start with me, then made the dinner. Destruction Testa held a few tools and bolts for me, and then wandered off with the only spanner that fitted the bolts. Nana Testa helped by looking after Lil’ Smasha all day and Daddy Testa was his usual sarcastic self when it comes to me using tools - but did help by fixing the electric drill every time I took a bit off and stopped it working properly. He also helped by removing his annoying presence and staying clear of the test zone until asked to get outside and fix things that were not working properly. Now it is a universal truth that I love building flat packs, and this was an excellent one as the instruction pack was all lovely diagrams and a little measuring line on the bottom to make sure you put the correct bolt in the correct hole, and plastic bits that you had to get the right way up. This can keep me happy all day, and it did, but it also had some annoying bits. Like when the pre-drilled holes in the plastic bits and the wooden bits didnt match up and you had to(get Daddy Testa) to come along and do some magic to force them to be right, before you can carry on with the flat pack fun. First a 30 second slide show of my progress, you can see from the shadows that this took me about six hours to do, and was started early but only just finished in the evening. You can also see the pure little boy joy that all the hard work brought about. SAND PIT TABLE CREATION You can also see my little supervisor in the background laughing at me and blowing raspberries as I go along! Destruction testa loves this product, he spent the entire Sunday after it was built driving cars around in the sand tray and pouring water into one corner so he had the right consistency sand to make castles. There were a few flaws in the flat pack though, all the pieces were there, but some of the holes did not quite match up and we had to drill them bigger with an electric drill. 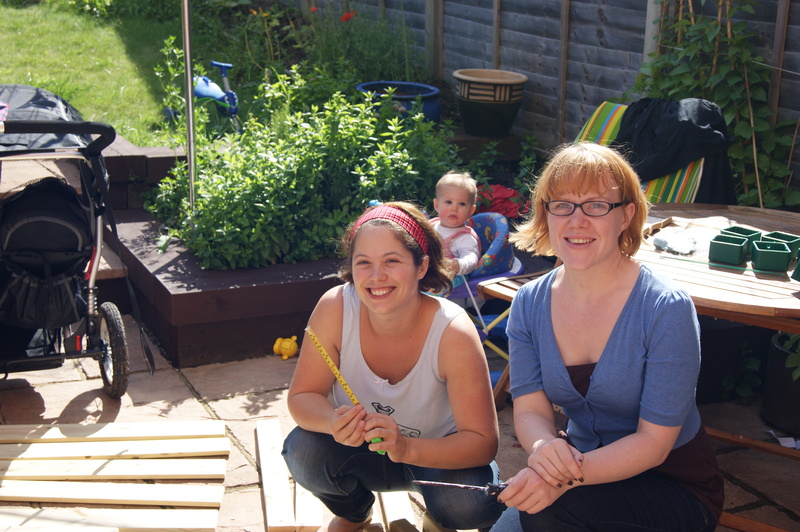 Also we have had to sand down some rough edges on the wood – i.e. not all of the planks had been de-burred, they are pretty rustic and if you don’t relish digging splinters out of young bottoms you are going to need a bit of sandpaper handy, or even a wood file. But the overall effect is smashing! 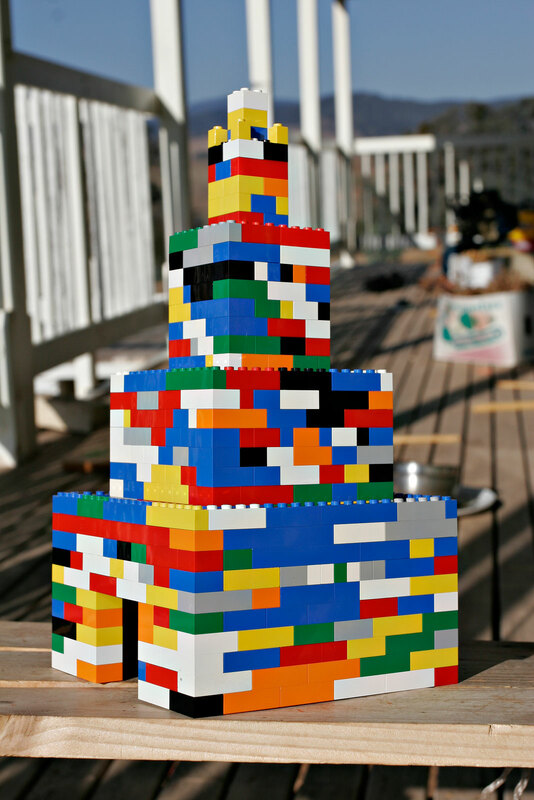 You’ll need a day to put it together, and probably some helpers to keep the nippers occupied as you build. It is faster with an electric drill rather than a single screwdriver. Also if you do have a socket set you’ll be able to get some of the trickier bolts tighter than using a spanner and brute force. This is because some bolts are ‘buried’ for safety inside a green plastic moulding so they are difficult to get at at times. 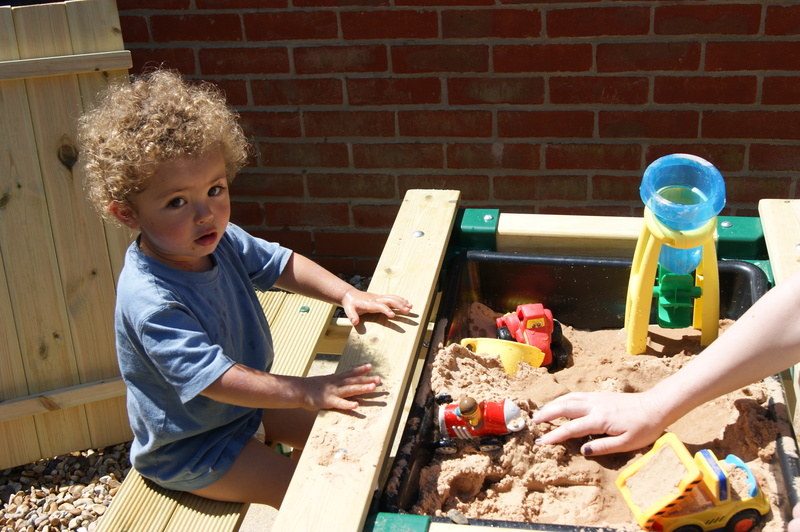 The sand box holds one B&Q bag of playsand, which is £5. And here is where we met Craig from Big Brother. Auntie Betty and myself went of to B&Q (after Demolition Daddy had set out and come back from our local Focus … which has gone bust and shut down). We spent some time trying to figure out which type of playsand we really needed. But then another Daddy, who was digging his own sandpit and needed about 20 bags of playsand broke open the bigger bag of sand and we discovered it was the ‘wrong’ colour i.e. it was orangey brown so that settled it. So off we went with our bag of send, all triumphant when we came across a little game that you had to play to win a leaf blower. Here is Auntie Betty having a crack at it ! So officially the sand in Destruction Testa’s sandpit has been especially endorsed by Craig last sunny sunday. And I have never seen a little boy quite so smiley and engaged. He is fantastic at sandcastles, even if I do say so myself … and even better at smashing them up. Even Lil’ Smasha got her tiny feet in there and kicked a few over, She has smiled and giggled to be able to push cars through the sand opposite her big brother and that is such a bonus with this picnic table. I think you could get four little people round it easily for sand pit games and it has already occupied them both for hours. A definite thumbs up from us! My Beautiful Destruction Testa trying out his sandpit. One more thing, I caught DT sitting inside the sand box bit after turning my back for a little while … it was not bowing at all so it can definitely hold the weight of a 2 and 3/4 year old. So the final word is it is a sturdy piece of kit, well designed for rough and tumbling little ones. Attrition Rate for one evening = 31p of crayons! 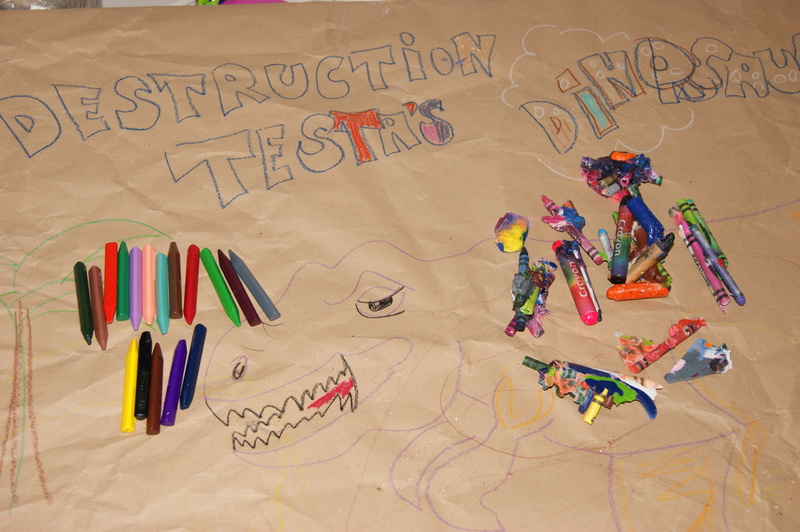 The first choice for Destruction Testa today from his 2011 Year Two Toyology review was the Melissa and Doug Crayons and Colouring Pad. Both the colours and the paper are high quality, the paper is of a good weight, definitely heavy enough to be stuck up and down on the fridge and walls a few times as it goes on display. This was a very timely toy to review as recently all of our crayons were melted in the garden because of some pesky sunshine that went on them. 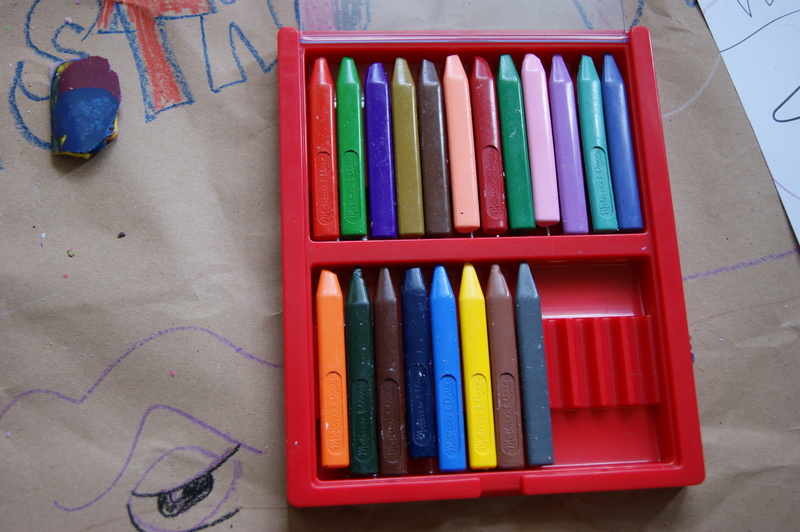 We kept all the interesting blobs of crayon though as they still work ... but are just a little harder to identify the exact colour of ... Melissa and Doug crayons are triangular (more about the humble triangle for my philosophy students later) so they do not roll off the table. They also claim to be stronger than regular crayons. Lovely New Crayons vs Yucky Melted old Crayons! But I don’t want to snap one yet to Destruction test that aspect as they are so lovely and new. We are currently creating some art, two pieces of dinosaur related art to compare. One is a colouring in from the Melissa and Doud pad, and one is a big dinosaur drawn on the paper that came as packaging in our ToyologyBox. destruction testa loves colouring. I’ll have to explain to you all that the blobs under the dinosaurs tail are not unhatched dino eggs but dinosaur poo. DT is fascinated by the idea of poo at the moment, I sincerely hope that it is because he is on the verge of potty training, rather than a general fixation. Only time will tell. 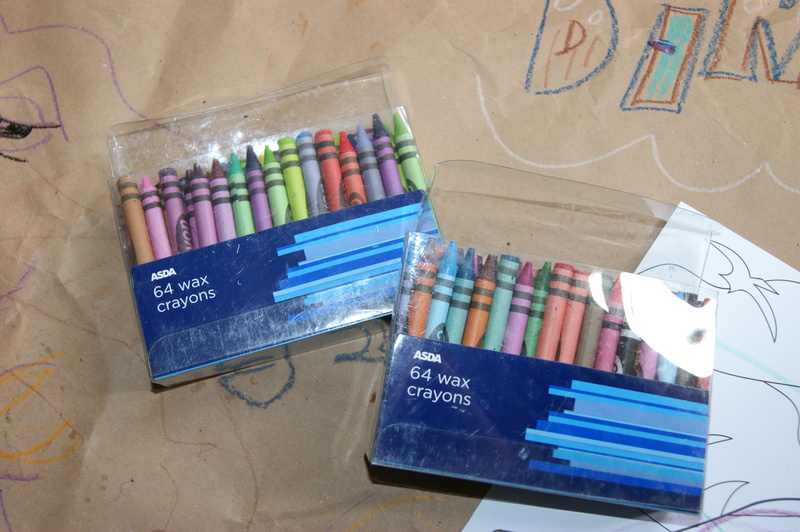 The Melissa and Doug 24 crayon pack is £2.49 on Amazon, and the Asda 64 wax crayon pack is (4 x 64) crayons for a mere £1.00 from Blackbushe Sunday Market (my usual arts and crafts stockist). So in terms of crayon attrition; On evening one we lost 3 melissa and doug triangular crayons, that works out at a whopping 31p, but in a sunny day of crayon melting disaster we lost approximately 30 crayons for the same price - but compare it to the three crayons and we only lost about sixpence worth of crayon amusement in the recent melting disaster. However, in terms of attractiveness, strength and smoothness to the touch, the M&D crayons are much nicer. Here is Daddy with a video explaining whether or not he thinks the Melissa and Doug crayons are actually more durable than the above cheap alternative! Nativists would say that we have an innate idea of a triangle – ‘Innate ideas’ are obviously meant to contrast with ideas gained from experience. We don’t come to understand about triangles by looking at the particular Melissa and Doug crayon. Rather than say that, nativists maintain that they are ideas the content of which cannot be gained from experience. Nativist arguments, then, tend to focus on how a particular concept or item of knowledge could not have been acquired from experience, and how its use cannot be justified by experience. Now since we do not have the concept or knowledge (whatever it is) from birth, there is some point at which we first come to be aware of it. And so rationalists argue that experience, for example of the particular triangular crayon, triggers our awareness of the concept or truth (some add that it is innately determined, e.g. genetically determined, that we will gain this knowledge at this time). But how does this idea of experience ‘triggering’ an idea differ from the view that we learn or derive ideas from experience? Here is a fantastic review by my students of the marvellous Richard Hammonds Blast Lab Messy Mess science game! So with my students well into revision, ahem, I have thrown out a few curve balls to help them get on with it. The exam for PHIL1 is on the 16th May, before study leave so this toy review of the Science and Magic test kit is to help them with some key empirical ideas. And to be amused by our own genuine scientist Freddie, who as well as Philosophy, has to be applauded in taking three science A-levels. A truly amuzing review and some great scientific tips there for parents not sure about how dangerous a chemistry kit might be for their little ones. 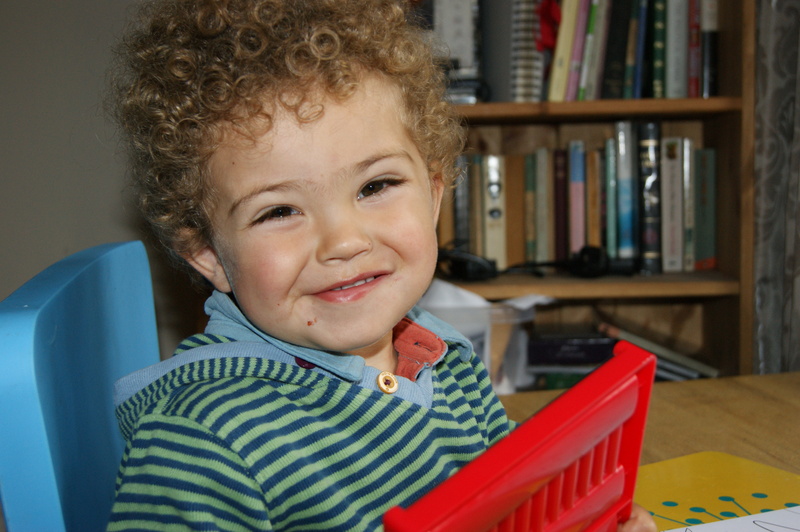 But remember your son or daughter could be inspired by science like our Freddie here and go on to enjoy further studies in science. Anyway, back to empiricism, my students have to come to an a posteriori understanding of the ‘tabula rasa’ thesis. Empiricists like John Locke and David Hume were deeply committed to the view that first-hand experience of the world alone, can give us knowledge. This is probably the reason any one even produces science kits for children, we know that finding out about the world involves getting involved with it first hand. They (Locke and Hume) are sceptical of the view that the mind, without the aid of the senses, can generate any knowledge at all. ‘A blind man,’ argues Hume, ‘can form no notion of colours; a deaf man of sounds. Restore either of them that sense, in which he is deficient; by opening this new inlet for his sensations, you also open an inlet for the ideas’. It has to follow from this argument that the mind of the new-born baby can only be, as Hume argues, a ‘tabula rasa’ on which experience comes to write down ideas from day one. So, consider the blank slate of your children’s minds and let them write upon it with experience, perhaps the experience of Magic Science is a good place to start. Let us then suppose the mind to be, as we say, white paper [tabula rasa], void of all characters without any ideas; how comes it to be furnished? Whence comes it by that vast store, which the busy and boundless fancy of man has painted on it with an almost endless variety? Whence has it all the materials of reason and knowledge? To this I answer, in one word, from experience. Hume, following Locke, further divides the idea of ‘experience’ into two: 1) Simple sense-impressions : just as physicists reduce objects to their composite atoms, so does Hume attempt to reduce all our experienced objects to the empirical atoms of colour, sound, smell, taste and texture (i.e. those grounded in the five senses). Such empirical ingredients are said to be simple, in the sense that they cannot be broken down further into even simpler units. Also included in this class are the ‘simple’ emotions of pleasure and pain, which he calls ‘impressions of reflection’. These ‘excite our sentiments’ as in the case of ‘pain of excessive heat, or the pleasure of moderate warmth’. 2) Complex ideas. The empirical ‘Lego bricks’ of simple sense-impressions cluster together to give us complex impressions/ideas – i.e. those of objects. Thus analysed, my ‘complex’ experience e.g. of a wound is reducible to the ‘simpler’ empirical elements of redness, roughness, heat and pain. Such is the nature of ‘experience’ for Hume and the other Empiricists. As you can see here, Destruction Testa’s Dad has gone to great pains to make you a lego tower to demonstrate Hume’s process of abstraction! So what is Hume’s view of ‘ideas’? These he takes to be ‘more feeble impressions (which) are copies of our impressions or more lively ones’ , like an inner film-show in our head. For example, the idea ‘red’ on this view, is a simple mental photocopy of the red impression; the idea ‘wound’, a complex one. Even ideas such as God, on this account, arise from ‘reflecting on the operations of our own mind, and augmenting, without limit, those (‘sensible’) qualities of goodness and wisdom’ encountered in experience – although this account was far from unproblematic. Ideas themselves are not as ‘vivacious’ or ‘lively’ as our actual impressions for ‘if you tell me that any person is in love, I easily understand your meaning, and form a just conception of his situation; but never can mistake that conception for the real disorders and agitations of the passion’. Likewise, for Hume, the mental picture embodied in my memory of Paris in the spring can never be as lively as my direct experience of that same object. 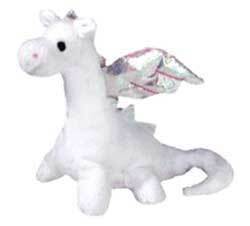 A possible objection to the tabula rasa thesis at this point might be that we all have ideas deriving from dreams and fiction, such as those of golden mountains, dragons, mermaids, unicorns, angels and the like, which have no exact correspondence in our experience of the real, everyday world. Such cases are not difficult to handle for the empiricist, for as we saw with Hume’s explanation of the idea of God, the mind is free to play around with, ‘augment’, ‘diminish’ and create anew, wonderful images, hitherto unencountered, composed out of its finite stock of ideas themselves produced by our experiences of the world (Even the rationalist Descartes is happy to concede such a point. See, for example, Meditation 1, the argument from dreaming and its solution). Colour, mountains, lizards, fire, horses, horns, fish, Madonnas and wings all coalesce, via the creative processes of our imagination, to produce such ideas. The mind, as regards this capacity for creativity, seems to be without bounds. However, note here, that Hume’s account of the creative imagination does rather contradict the idea of mind as tabula rasa insofar as a blank sheet simply does not have the capacity to creatively re-arrange what is written on it, in this manner. 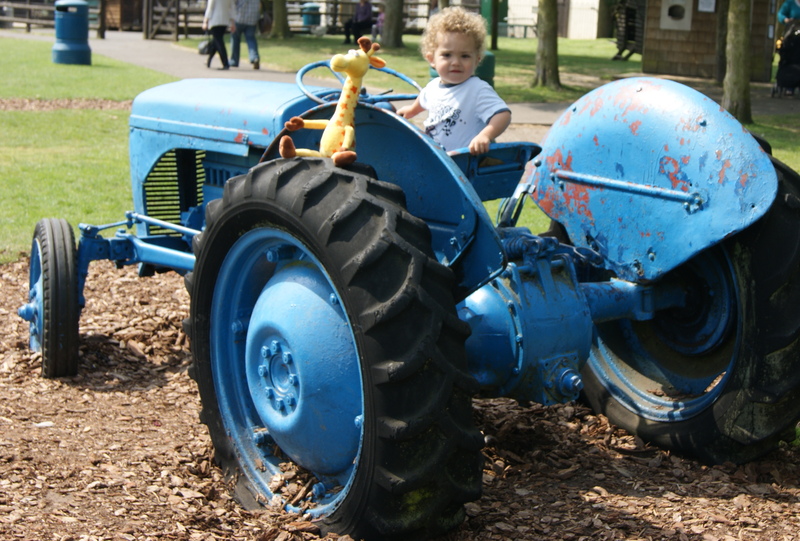 Geoffrey showing you an example of the type of shade of blue that Hume's fictitious person might have missed ! He dismisses such an anomaly as ‘scarcely worth observing’, but it does constitute a troublesome counter-example; one exception is all that is required to refute a general rule. The oversight, perhaps, lies with Hume here as one can arrive at such an instance via the shades on either side (lighter and darker) that were the objects of the senses. That a man could formulate an idea of blue without ever having experienced blue things alone would be enough to refute the thesis. 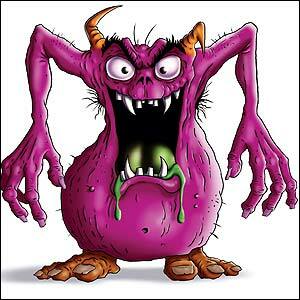 A further problem arises when thinking of those classes of things that enable us to sort instances in the world – e.g. the concept of ‘motor car’ that enables us to pick out the neighbour’s Ford Mondeo. It is just not possible on their account to have an abstract ‘invisible’ thought as it were, of a class such as the bare idea of ‘car’ because this would not be something we could have experienced in the world. All we can ever actually experience are instances of the class (Hume points out we cannot entertain the idea of, for example, ‘dog’, without our thoughts leading us back to a particular image of a canine). Even if we try on this view to imagine a kind of very basic, universal car such as one gets in childrens’ first picture dictionaries, this will still, in a sense, be an instance of a particular car. Abstract and universal ideas, by their very nature, cannot be pictorial. The greatest problem for the Empiricist here, however, is posed precisely by that class of very abstract ideas mentioned earlier, that determine the underlying structures of all rational thought. How for example, can we, on Hume’s account experience such abstract ideas as ‘truth’, ‘identity’ or ‘causation’? An identical problem is also posed here by the class of moral values, such as ‘justice’ and ‘benevolence’, which likewise, do not seem to be reducible to a set of simple sense-impressions, any more than our ideas of ‘truth’, ‘identity’ etc. The same goes for the all-important idea of ‘causality’ which, unlike the events that it joins together is never directly experienced. The cue hits the billiard ball and causes it to move, but all you actually experience on Hume’s view, is these two events, not the abstract, structuring idea of ‘cause’ itself. Of course our repeated experience of a always following b gives us the idea that there is a causal connection, but all we can ever know from experience is that a always seems to follow b.
Hume does provide a kind of explanation of how we acquire moral values in terms of their being traceable back to impressions of reflection, in particular the emotion of ‘sympathy’ (see Treatise Books 2&3). However, for the most part, Hume is compelled to dismiss as fictitious creations of a fanciful imagination, any belief in the real existence of those abstract ideas that seem to underlie the very structure of our thought. We simply have no experiential grounds for believing in something called a ‘cause’, nor in the abstract idea of an ‘identity that continues over time’. All that we have in the end is a flow of simple sense-impressions. At this point, it starts to look as if the rationalist explanation of such concepts as existing prior to experience (innately) may well have the edge. Much of Hume’s problem here may be seen to arise from his treatment of ‘ideas’ as mental images – i.e. complex pictures of the world in our head made up simple sense-impressions. However, as we have already pointed out, we have only to consider those kind of abstract ideas that structure all our daily thinking – as embodied in words like ‘however’, ‘nevertheless’, ‘perhaps’, ‘therefore’ etc to see straight away that these ideas cannot be pictorial. We can form no mental image of ‘true’, nor does the idea of ‘disagreement’ present itself to the mind as an image (what strange things are concepts!). In looking at how our concepts are really formed what gets most overlooked here is the invisible presence of language itself, as opposed to mere mental picturing. Of course, in the case of ideas such as colour, resonance, taste, texture and smell, it is difficult to see how we could acquire such concepts without recourse to experience, but these elements form only a part, and arguably a small part, of our linguistic practice, which is primarily directed towards bare meanings, whose existence is not dependent on accompanying mental imagery – although such accompanying imagery may render it more vivid. I'm a Toys R Us Toyologist!